Decent, if slightly derivative, doom metal. Pretty standard stuff, mixing classic Candlemass/Black Sabbath doom with power metal influences, but it's been done before. 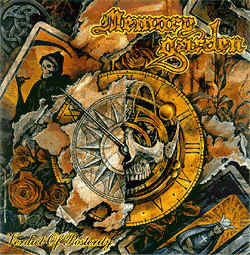 Unlike much of the modern crop of good doom bands, Memory Garden doesn't really overwhelm you with emotion. The music is more of a by-the-numbers effort, the band doesn't really cut loose creatively. The singer has a good, mid range clean vocal that delivers on it's singable, if predicatable, melodies. The riffs and music are well executed and convincing. Good musicianship, songwriting and vocals, but there's not enough here to push this record into the "excellent" range. It pretty much defines the term, "good, not great". I realize that this review might be slightly deficient for most people, in that I haven't pointed out exactly what's wrong with the album. I'm sorry, but there's not much to complain about with this album, it's definitely a solid all-around effort. The main problem is that I don't find myself going back to listen to it. Bands like Solstice are doing a similar thing in a much better way.